A: Great question! 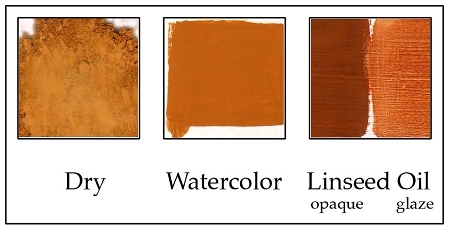 This pigment is a naturally occurring earth pigment. Although the tinting strength is higher than most earth pigments, this sienna has a lower tinting strength than a manufactured iron oxide. Manufactured iron oxides contain 100% iron oxide, whereas naturally occurring siennas and ochres contain 75% - 85% naturally occurring iron oxides, along with such "impurities" as silica. We here at Sinopia, however, believe that these impurities only enhance the color, by creating a slight variation within the color when it is used in plaster or as a glaze. Just think: iron oxides: dead flat synthetic; natural earths: vibrant rich organic.